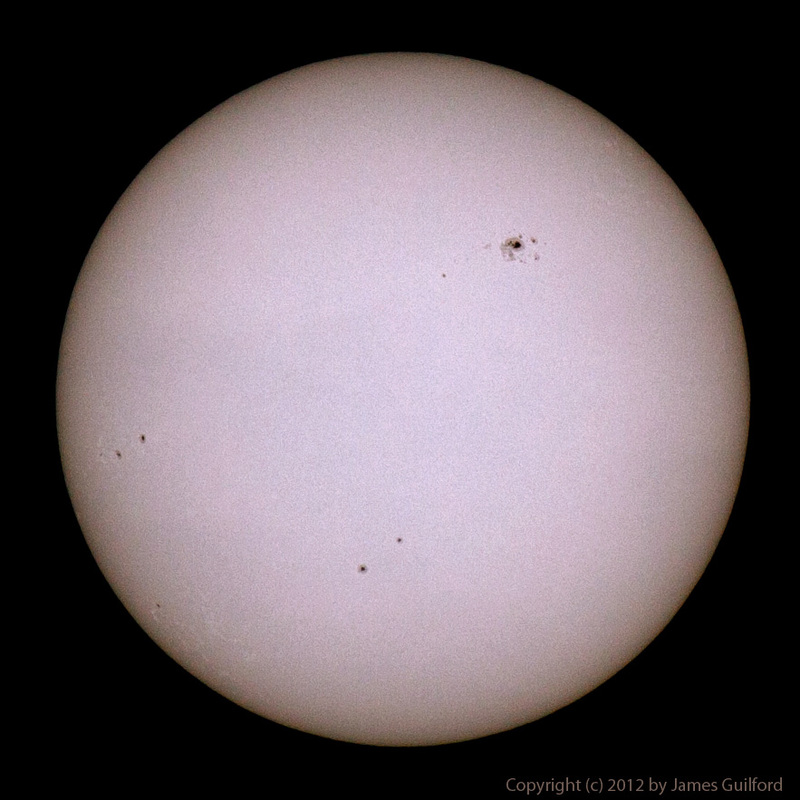 Sunspots, including the group AR1476, blemish the face of the Sun. Sunday, May 13 dawned reasonably clear and so, with cloudy skies anticipated, a few rushed photographic observations were made of our Sun. I had to fit that in before visiting Mom for Mother’s Day! Active Region1476 (a huge sunspot group) continued to dominate the solar disk though it had been joined by several smaller but notable sunspots blemishing old Sol’s face. Also visible in this photo are granulation and other disturbances — the chromospheric network — in the solar atmosphere. Notes on the photo, the best image I’ve done of the Sun so far: Canon EOS 50D, ISO 400, f/8, 1/1,250 sec., 400mm Canon telephoto, AstroZap white light film solar filter, May 13, 2012 at 9:15 AM. The sky was reasonably clear though this image was captured through a thin cloud, the remains of an aircraft’s vapor trail.